This is one of those books that reminds you that sticking it out can be so worth it. 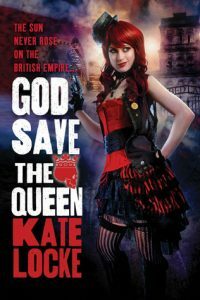 God Save the Queen, by Kate Locke, is a different kind of vampire tale. It centres on Royal Guard Xandra Vardan, a halvie human-vampire, who’s just trying to find her sister when she finds herself mixed up in something much larger. It’s set in a London that’s still ruled by the immortal Queen Victoria, and is still imbued by the Victorian Age. It’s this setting, the mishmash of the modern (with different names) and historical, that tripped me up at first. I got too caught up on details, and was going to give up. Instead I convinced myself to give it one more night. I’m so glad I did. Goblins, werewolves and vampires, oh my! 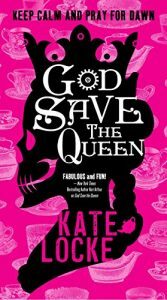 I’m still digesting the ending, it left me a little discombobulated…and wanting to read Book 2: Long Live the Queen. In the end, I had to let some of the details of the world wash over me and just go along with it. But, once I did, boy I did, did I enjoy the ride. The characters were interesting, especially Vex MacLaughlin. The story opened lots of questions to keep pulling me forward, and I was rooting for the main character. I enjoyed reading about Xandra – she has the right amount of quirk, self-doubt and self-deprecation.